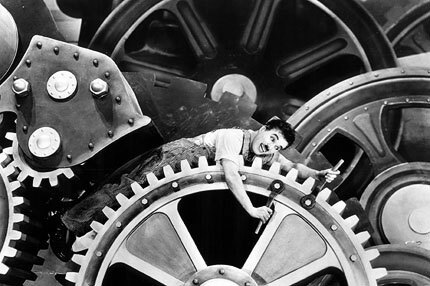 This lesson uses Charlie Chaplin’s hilarious classic film, Modern Times, to help students think about the impact of “scientific management” on the workplace. 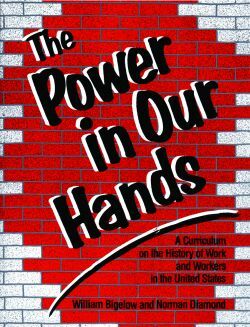 Charlie Chaplin’s Modern Times is a graphic and entertaining illustration of two lessons from Bill Bigelow and Norm Diamond’s The Power in Our Hands, also included at the Zinn Education Project: Paper Airplane Simulation and Free to Think, Talk, Listen, or Sing. Paper Airplane Simulation demonstrated the transition to increased management control and the lessened skill levels and less meaningful work that followed. Free to Think, Talk, Listen, or Sing gave the historical background. Here students see the workplace consequences. Although the movie is a caricature, it highlights people’s real experiences. Notice the absence of black workers, who will shortly become an important force in unionizing heavy industry. In this simulation, students make paper airplanes to learn about the origins and effects of “scientific management”—owners’ attempt to capture workers’ skills and knowledge, and then to exploit that knowledge to reorganize work and cut costs by deskilling workers.